RFC 61: Prodigal Sons Return in 3D! 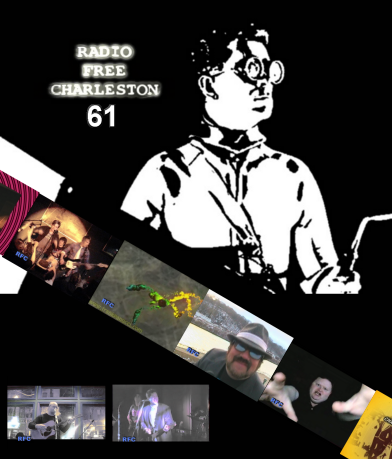 Radio Free Charleston’s sixty-first episode, “SHINDIG Shirt” is online now! In this episode, we feature three triumphant returns from musical acts who got their start in the Charleston area, then moved away, before the draw of their hometown brought them back for return engagements. The cool thing is that I didn’t realize this theme until after I dropped off the show at the Gazz office. It wasn’t on purpose. It was some kind of karmic kismet-certainly more impressive thematically than the running gag about 3D that I thought tied the show together. 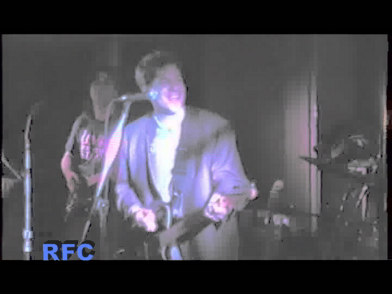 Our musical guests are John Radcliff, back in town for a visit after moving to Parkersburg; SHINDIG, direct from Louisville: plus a special treat from the RFC archives: Brian Diller performing at the Empty Glass in the early 1990s, after he moved to Nashville. We also have animation from Frank Panucci, and a message from author, Brian J. Hatcher. You may have seen Brian in the Gazette-Mail last Saturday, or at this slideshow, smokin’ his damn pipe. Up first this time is John Radcliff, shot at Taylor Books a few weeks ago. This was the same night that we recorded Joseph Henry and the clip of Rad that we brought you last week. 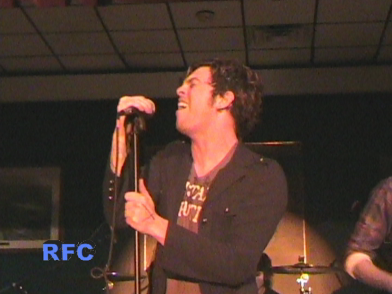 Here we catch John solo, performing his song, “It Might Work Out.” In addition to being a long-time friend of RFC, dating back to our radio days and his Swivel Rocker days, Rad has appeared on consecutive episodes of RFC more than any other guest, starting with his three-episode run from RFC 16to 18. Now we feature him back-to-back again. And we still have stuff from two years ago that we haven’t used yet! 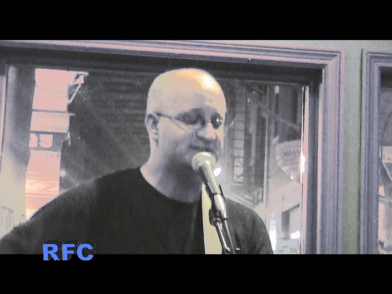 As well as being a long-time friend of RFC, John is also the mastermind behind the Parkersburg Songpull events, and is responsible for introuducing us to cool people like Josh Buskirk, Joseph Henry and Don and Deron Baker. Plus he’s got a cool house. I tried out a new “Film Noir” look with this video. Let me know if you like it. That’s what the comments are for, you know. Also, Rad was yesterday’s art boy, here in PopCult. SHINDIG is one of the most popular bands to come out of West Virginia in recent years. While Richie and the gang have relocated to Louisville en route to conquering the world, they still like to come back and play for their hometown fans. The paucity of all-ages venues in the area has kept them from playing here for a couple of years, but now that they know about The La Belle Theater, I’m told they’ll be returning on a regular basis. They’re currently touring the world, collecting the souls of new fans on a daily basis. 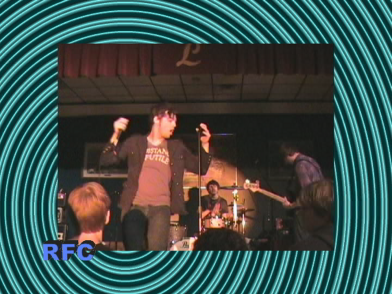 We recorded the band at The La Belle the day before Valentine’s Day, and the video for “I’m The Type Of Guy” was edited by yours truly late Monday night. I do have a confession. There were technical glitches early in the tune that obscured the vocals, so for the first line of the the song, I borrowed some audio from the studio recording. If I hadn’t, I probably would have scrapped the song, and it was just too good for that. So this is SHINDIG “mostly live” at the La Belle. We also have a musical blast from the past this episode. I recently hooked up with my old buddy, Brian Diller. I finally went over to the darkside and joined Facebook (you can check out my cranky profile here) and got in touch with Brian for the first time since the early 90s. Which was when this song, “Ride,” was recorded at The Empty Glass. I’m hoping Brian will use the comments to remind me who his rhythm section was that night. I do know that we have none other than Micheal Lipton on guitar (One of these days we need to get him doing some new music on the show, instead of seeing him via twenty-year-old clips) . A special treat for this song is the sudden surprise guest backing vocals by Greg Wegmann, guitarist for The Ride and one of the owners of LiveMix Studio. I guess he was familiar with the song. Brain expects to be back in town for a show this June, and RFC Big Shot Melanie Larch and I intend to be there. Host segments were filmed Monday evening at Haddad Riverfront Park. A word of advice: Don’t shoot video on the banks of a river when the wind-chill factor is absolute zero. Seriouly, I almost slipped in a puddle of liquid Argon. The jump cuts this time were due to either camera glitches from the cold, or brain glitches. In the last host segment before the credits, you can actually see my brain shut off for a moment as I forgot who we had lined up for next week’s show. I had a script, but it was too cold to fish it out of my pocket, so I ad-libbed the entire show. It was freaky-cold. I’d never gotten prune hands from the cold before. As we wrapped the shoot I looked down at my hands ( I never wear gloves) and they were gnarly, shriveled and bone-white. It was as if Keith Richards’ hands were protruding from my sleeves. That’s the story behind this week’s RFC. Next time we’re looking at bringing you new music from Tofujitsu and Portsmouth Ohio’s The Bible Beaters. Don’t forget, you can now check us out on Facebook and MySpace. See you there.